Here is what you'll need to cook Beer Pretzels with Beer Cheese Dip for Servings: 4 peoples. 1. Cut rind off soft cheeses while they are still chilled, then cut into cubes. 2. Blend cheeses with fork, then add cream cheese, beer, spices, and diced onion and mix again. When well incorporated, stir in salt & pepper to taste. Chill. 3. Take pizza dough out of package and roll into a ball. In a large bowl, add beer and flour to the dough and mix with hands until firm and not sticky. Add more flour if needed. 4. Rip off a piece of dough and roll it into a 6-inch long log. 5. To form the pretzel, pull the ends of the log to the top of the circle. Twist the ends around each other once and bring them down to meet the bottom of the circle. Then transfer to a baking sheet. 6. Repeat until all dough is formed into 12 pretzels of about a 3-inch diameter. 7. Chill pretzels in the fridge for 20 minutes. 8. Preheat oven to 425˚F / 220˚C. 9. Bring five cups of water to a boil in a medium pot. 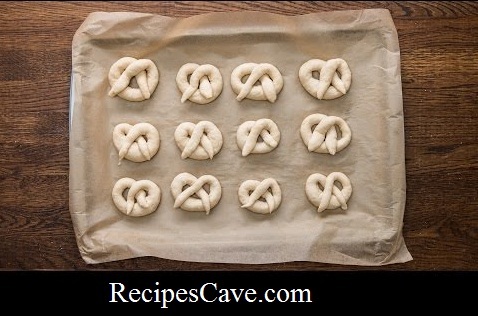 Add the baking soda to the water and immediately add pretzels. 10. Boil for 20-30 seconds, then take out and place on a baking sheet lined with parchment paper. 11. Brush egg wash onto the top of each pretzel, then top with coarse salt. 12. Bake for 15-20 minutes or until deep brown. 13. Before serving the beer cheese, garnish with sliced red onion, if desired. Cheese mixture can be used as dip or spread. your Beer Pretzels with Beer Cheese Dip recipe is ready.